← MS PROJECT 2010–The “Wedding” Project. Sample! I say: “THANK YOU A LOT!” for your comment. Obviously I have to give some further explanation. With my blog posts I was started with Planning phase “from the scratch”. In real life, in every Project, in early phase of planning, there are mistakes. In my last posts I put some Task, Resource, and Project Calendars. I will now continue to make my plan for the Project. I will building the schedule, define and assign resources, and add the costs and budget. After that I will show you where the mistakes are made, and I will explain how to correct them. Then I will save the Project Plan as a Baseline, and the work will start. Of, course I will track “actuals” vs. “planned” values. This Blog post will be short, and there will be no samples. Why? Because before making a schedule you have to know the theory! After that we will build the schedule in MS PROJECT 2010. You can build your schedule before you know your resources (it means, EHO WILL DO THE WORK?) or, if you have known resources and their availability, after you put them in MS PROJECT 2010, and set up their calendar (if it is different from Standard Calendar in MS PROJECT 2010) you can build your schedule. For our “Wedding” Project I will first estimate duration for all my Tasks. How can I do it? That was easy. I will show you duration of my Tasks in the “wedding” project in my next blog post. But, the question is: “How do I know the duration of my task?”. It can be 1 day, or 1,5 day or 5 days? Be very careful. If you have the Resources assigned to your Project, and they give you estimated Task Duration you should know those person very well! Why? Because, they can be over optimistic, or over pessimistic, more or less experienced so they can do the wrong estimation. What does it mean? It means that if you do not have proper resources for your project, or you do not know them well, estimations can differs a lot from real time needed for your tasks. And last, but not least, you should always have a proper Resources for your Project. 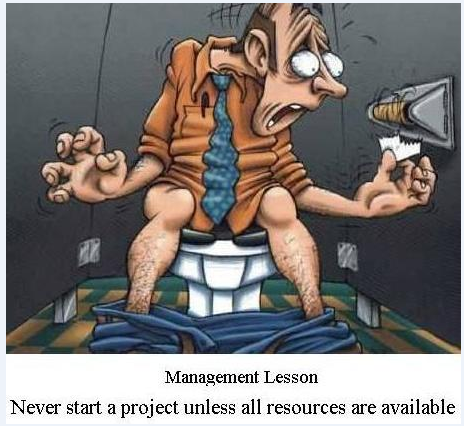 Here is the funny picture about resources from internet. I hope that you will not be offended by this picture. In my next post I will start to build the schedule for my “Wedding” Project! This entry was posted in MICROSOFT PROJECT, Microsoft PRoject 2010, MS PROJECT 2010, PMI, PRoject Management and tagged Microsoft Project 2010, MS PROJECT, MS PROJECT 2010 - Schedule, Project Management. Bookmark the permalink. can i see y our project schedule? ?